John Connell is a second generation custom home builder growing up in San Antonio. He began his career in the early 1980's working with his father earning his experience and reputation in all aspects of home building and the industry. 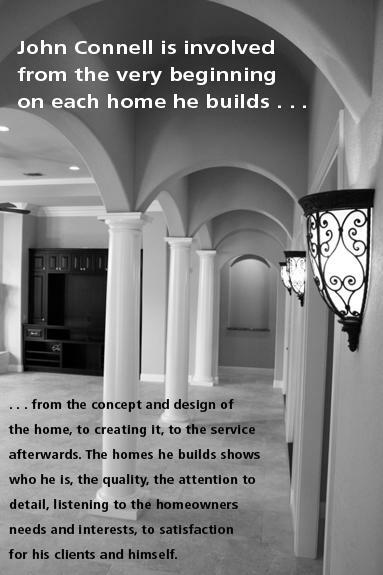 He believes that your custom home should be beautiful, comfortable and have lasting value. To create a home that's tailored to your lifestyle. We build just a few homes at a time, allowing us to give our clients the time and attention they deserve and the quality that's expected. His passion is the lasting relationships he builds with his clients from start to finish and beyond, along with making the entire process a positive experience and for his client to simply have "fun". Specializing in designing and building custom homes in the wonderful city of San Antonio and surrounding areas and on your private lot or acreage.